This is an excellent deciduous shrub for screening up to 10 to 12 feet high. It grows to a width of 8 feet with very dense growth of up to 3 feet per year in full sun or part shade. 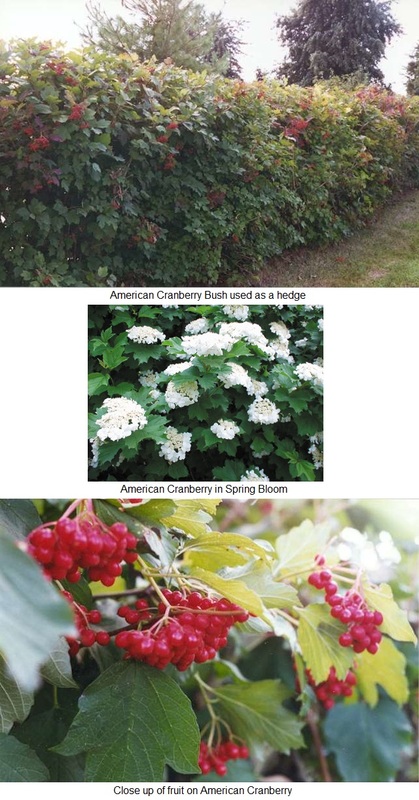 The American Cranberry Bush has showy white flowers in spring followed by red berries in fall and winter. These berries hang through midwinter, making excellent bird feed. This shrub has very few insect problems and prefers good, well-drained soil. For best growth, provide supplemental water during drought periods. For a solid screen, plant bushes 2 to 3 feet apart. 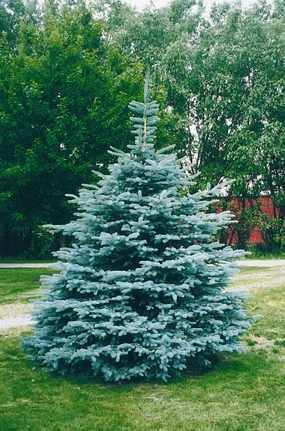 Beautiful silver blue to green foliage is the hallmark of this evergreen. For best growth, plant in full sun. This hardy tree requires little pruning to maintain the pyramidal shape and is tolerant of most soil types, although extremely wet sites should be avoided. With a growth rate of ½-1 ft. per year, this evergreen will reach approximately 30 ft. in height and 15 ft. in width at maturity. Our unique seed source results in 90% or more better blue colors. 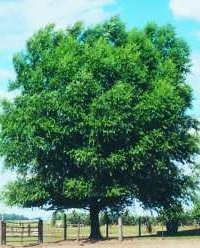 This specimen tree looks great by itself or planted in clusters or shelterbelts. This is an exciting, colorful new plant from our trials. The 1-2 year old stems on this fast-grower are a graduating yellow orange red color late summer through winter. It looses its leaves late fall to fully reveal its colorful branches. Coral Snap™ is hardy and seedless in our trials so far and should grow to 20 feet or more tall with a width of 12 feet or more. Coral Snap™ will grow in almost any soil type except very dry. It will thrive best in a moist site with full sun. In our trials, it has grown 12-14 feet tall in 2 years. It is great for windbreaks due to its dense branching. Plant at a 6 feet spacing for a colorful screen. 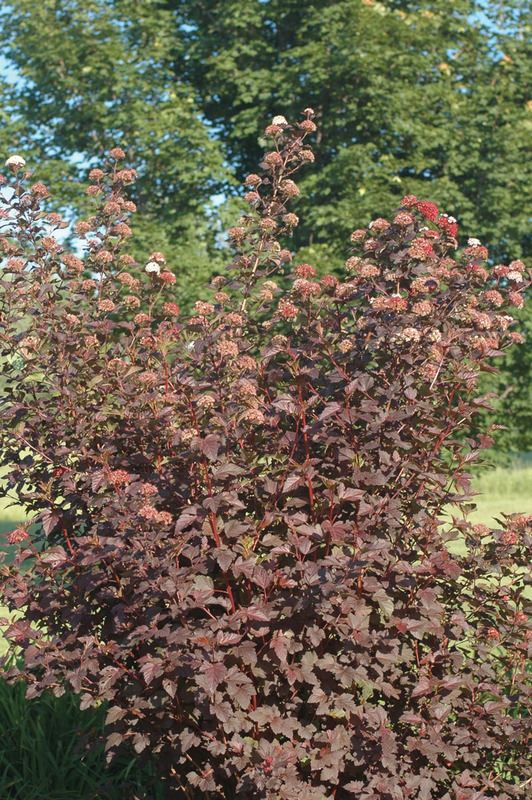 This Ninebark is prized for its deciduous, colorful deep purple-red foliage in summer with pale pink flower clusters in spring, on upright arching branches with exfoliating bark. Diablo® can grow 1-3 ft. per year and mature at 8 ft. tall and wide. It will tolerate dry conditions but prefers moist soil that is not water-logged. It will grow in part shade to full sun. The color may change to green during very hot summer conditions in the southern states. Plant 3-5 ft. apart for screen or hedge. With a growth rate of up to 3 ft. per year, Eastern White Pine will be a striking addition in any landscaping in just a couple of years. 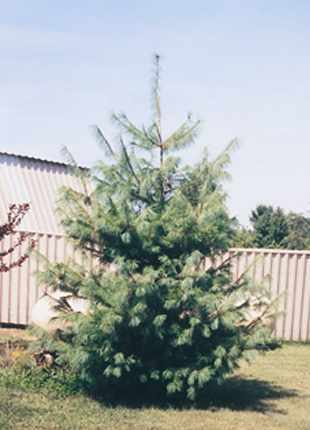 This fast-growing conifer can be identified by its soft green needles and straight trunk. For a fuller tree at maturity, lightly prune tree during the first 2-3 years. Although it will thrive in partial shade, full sun conditions promote faster growth. Will not tolerate wet, swampy conditions. 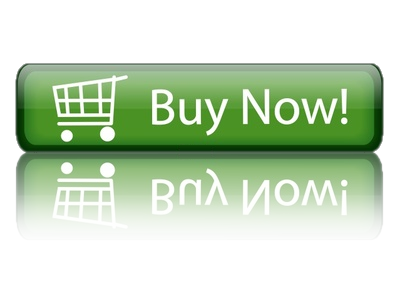 This is the evergreen of choice for very narrow screens. It requires no pruning to keep its tight, compact columnar shape. Planted in sun to part shade, it will grow to 18 ft. tall and 4 ft. wide. Plant 3 ft. apart for a lustrous green screen year round. Emerald Green grows about 1 ft. per year in a wide range of soils, although it will not tolerate wet, swampy soils. In addition, the arborvitae is not salt tolerant, so avoid road-way planting. 18‑24 in., field potted, #2 container - This item is dug to order, 7 days notice required. 30‑36 in., field potted, #5 container - This item is dug to order, 7 days notice required. 4‑5 ft., B&B (balled & burlapped) - This item is dug to order, 7 days notice required. Forsythia is a fast growing, upright deciduous shrub with arching branches that are pest and deer resistant. Bright yellow flowers cover the branches in early spring before the green foliage appears. Although it will tolerate some shade, the best flowering occurs in full sun. 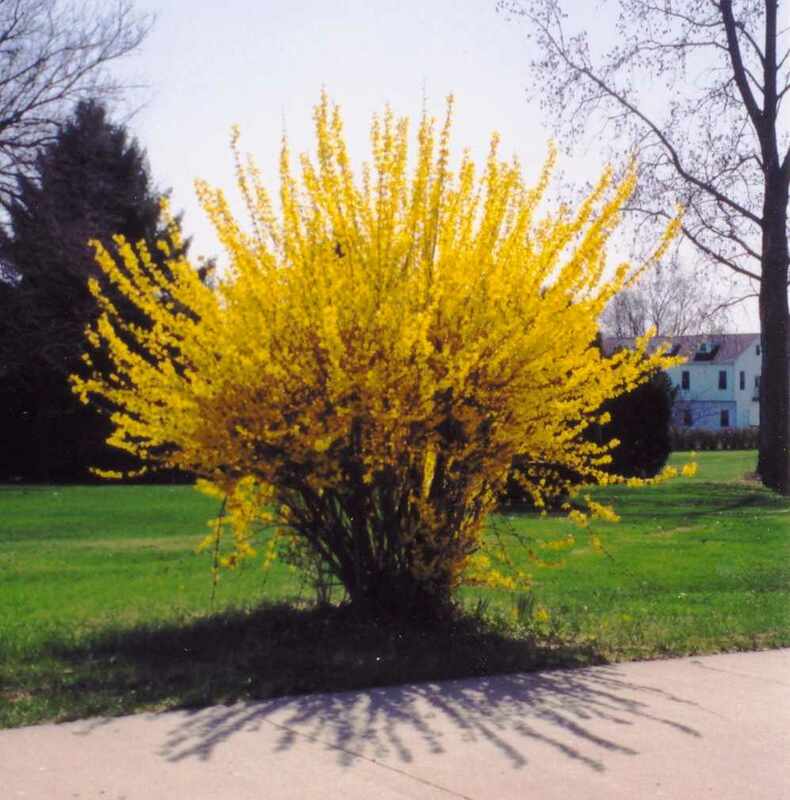 Forsythia grows to 10 ft. tall and 12 ft. wide and grows in almost any soil type, except very dry. It makes an almost impenetrable hedge/screen due to its dense branch habit when planted 4-5 ft. apart. 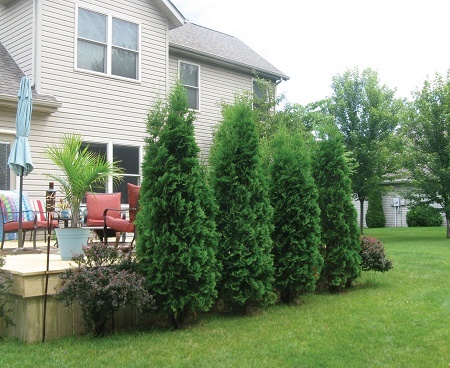 A fast-growing evergreen for year-round screens and windbreaks, the Green Rocket Hybrid® (Thuja Plicata x Standishii) can grow 3 feet or more per year. In fact, on the east coast there have been several instances of 5 feet of growth in a single season on established plants. Till or Disc strip of soil 4 feet wide. If possible, incorporate peat moss if you have heavy clay soils. Plant at 4-6 foot spacing for solid screen in just a couple years. Use fertilizer tablets or time release fertilizer, at least a few inches away - none in direct contact with roots. Do not plant in wet swampy soils or dense shade. Protect plants the first winter where they are subject to extreme wind conditions in wide open areas. This may be done by using plastic snow fence and burlap, etc. Mulch a minimum of 3 foot circle around each plant and protect from herbicides. 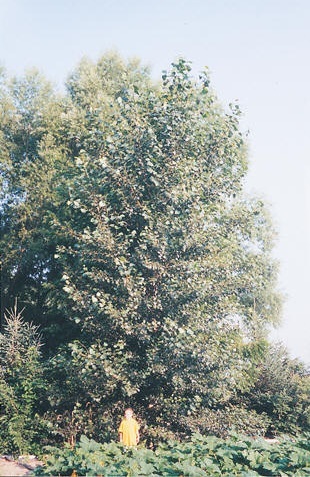 Great for quick shade or windbreaks, Hybrid Poplar is an extremely fast growing tree with growth rates up to 8 ft. per year. It will grow to 60 ft. tall and 30 ft. wide. This is the most disease resistant and longest living of all the hybrid poplars. It has a life span of 40 years or more, and grows best in full sun with deep, moist soil. It will tolerate poor soils and drought, although it will grow more slowly under these conditions. 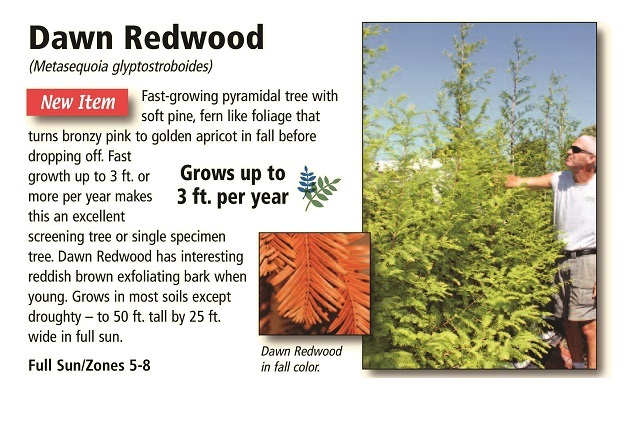 This very attractive pyramid evergreen is the fastest-growing type of spruce. When established, Norway Spruce can grow 2 ft. or more per year. 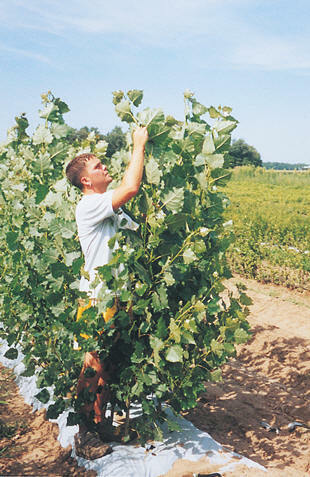 With a height of 60 ft. or more and a 20 ft. spread, it is good for windbreaks or screens. It does not tolerate extremely wet conditions. The Dogwood is a thicket-forming shrub that quickly grows to 10 ft. high by 7 to 8 ft. wide. 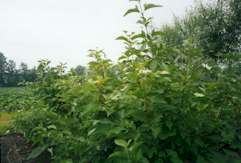 It has small, white flowers that are followed by small, white fruit. In the fall, its foliage turns from green to purple. In the winter, the stems are red, providing a nice contrast to the snow cover. This plant is rugged, tolerating most soil conditions except for droughty soils. With additional water, growth rates of 3 to 4 feet per year are possible. It will even grow in wet, swampy conditions and may thrive in sun or shade. The Dogwood is good cover for birds and wildlife. For a screen or windbreak, plant 2 to 3 feet apart. Rose of Sharon is a quick growing shrub that flowers from mid-summer to mid-fall. It makes a very showy screen that grows to 10 feet tall and 5 feet wide in full sun. It grows well in a wide range of soils except for the very wet or very dry soils. Prune Rose of Sharon back in very early spring to encourage the best flowering. Winter dieback can happen at temperatures of 20 degrees below zero. 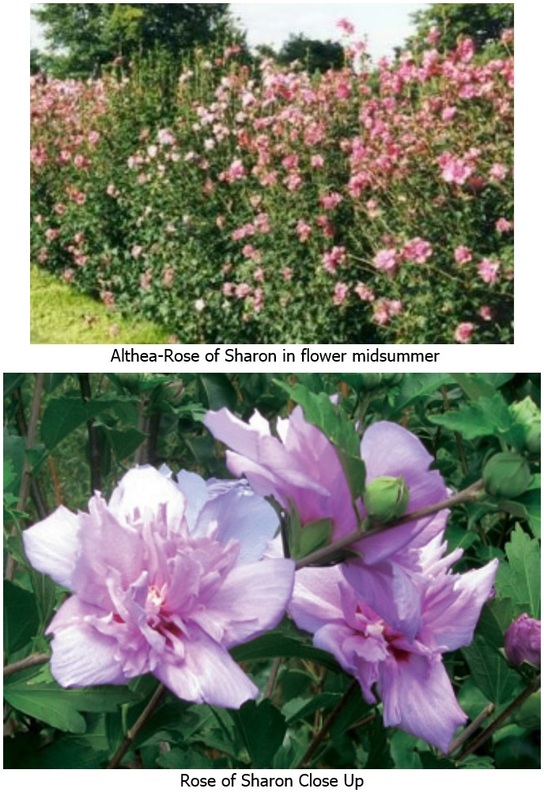 Rose of Sharon is also called Hardy Hibiscus and has flowers in red, pink and purple. Plant 3-4 feet apart for colorful screen. 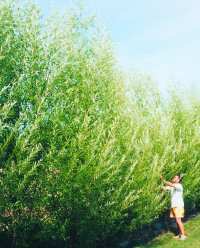 The Rosemary Salix has dense growth and fine textured leaves similar to the herb Rosemary. Stems turn a deep purple/brown in winter. Provides excellent screening spring through late fall. Leaves are silver on the underside and hang on very late into the fall. This shrub has grown to 10 feet tall and 8 feet wide in 3 years in our trials and is seedless. Thrives in moist and wet sites but is moderately drought tolerant. Great year round windbreak under power lines due to its controlled height and dense branch structure. For best results plant at 6 foot spacing. Plant in Zones 4-7, full sun to partial shade. Skyrise™ Hybrid Salix trees are sterile male hybrid clones that are hardy and disease resistant. The original trees were discovered in Illinois in 1991, and they can grow 5 ft. or more per year. They can be used for privacy screens, windbreaks, shade, dust barriers, soil conservation, erosion control and general landscaping. Skyrise™ trees natural growth pattern is to branch from the ground up, but they can be trimmed and trained into a shade tree shape. They have proven hardy to -30 °F. Skyrise™ trees grow well on a wide range of soils, including very wet locations. They do not spread by seed or root suckers and have an estimated life span of over 40 years. 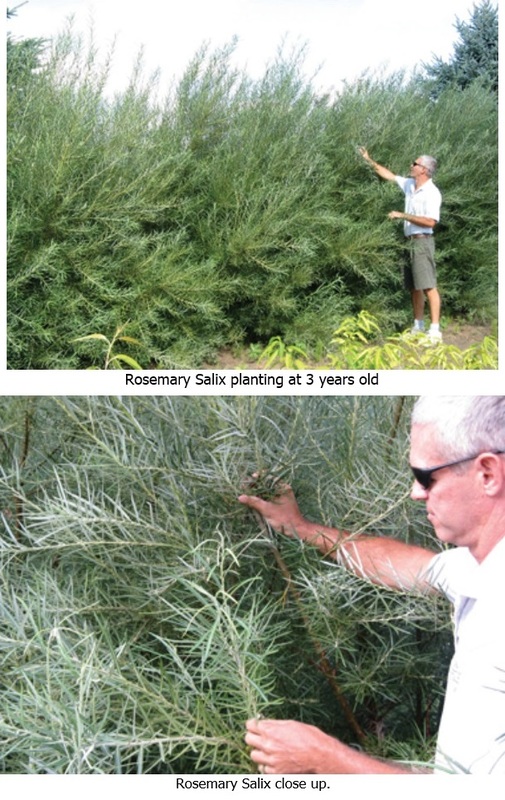 Skyrise™ Hybrid Salix are propagated from hardy stock and grown at our nursery site in northern Indiana. Proper site preparation is the key. Deep ripping or tilling of the site is required, as well as weed and grass control. Mulching and supplemental watering the first year will also enhance growth. 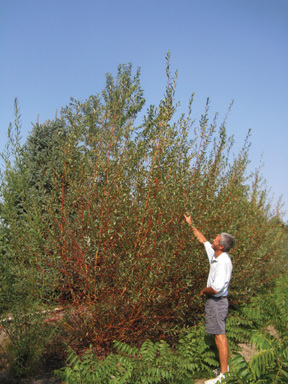 Skyrise™ Hybrid Salix must be planted in full sun for growth of 5-6 ft. per year or more. November through May are the best months to plant (provided the soil is not frozen) the bareroot forms of Skyrise™ trees. Although we do plant well into the summer, regular watering is critical for good growth. Potted plants can be planted any time of the year. Skyrise™ do lose their leaves in the winter. However, they make an excellent year-round windbreak due to their dense branch structure. Plant Skyrise™ trees 5-8 ft. apart in a single row or 6-10 ft. apart in a double staggered row for a thick windbreak or screen. Skyrise™ Hybrid Salix are sensitive to herbicides, so protect them from lawn care and crop herbicides. Skyrise™ will grow to 50 ft. tall and bush out to 20 ft. wide. 5-7 ft. of growth per year is common the first few years under good conditions. Roots extend 5-10 ft. beyond the drip line of the trees. Shade tree form will grow to 40 ft. wide by 50 ft. tall. Skyrise™ trees will perform well in moist to wet swampy conditions. For superior growth, supplemental water may be needed during dry conditions the first one to two years. A deep watering of the root zone is best every 5 to 7 days during dry periods of the growing season. Skyrise™ are very easy trees to grow provided you keep roots moist at all times during the planting process. Never put fertilizer directly in the planting hole unless you use our slow release planting tablets. Keep Skyrise™ trees in a bucket of water during the planting process. If you wish, you may immerse the roots for up to 8 hours before planting. It is extremely important to keep the roots from drying out even for a few minutes before or during planting.